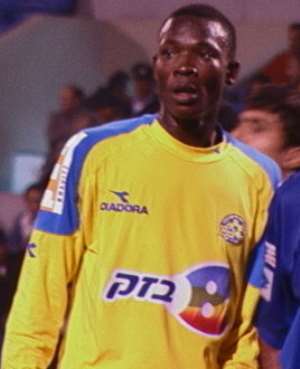 Maccabi Tel Aviv's John Pantsil has taken much of the blame for the club's poor form. A bruised and battered Maccabi returned to Israel yesterday following its 5-1 drubbing at the hands of Bayern Munich in the Champions League on Tuesday. Players threw accusations at each other as the infighting that has tainted the club's image in recent years raised its head once again. "The coach doesn't believe in me, and players aren't speaking to me" Ghana defender John Pantsil said in a television interview after the game. Pantsil has been blamed for several defensive errors and has been isolated by the rest of the team. On the bus back to the hotel after the game, players exchanged SMS messages ridiculing Pantsil. The Pantsil affair is far from the only problem troubling coach Nir Klinger, however. Once again, the team has split up into opposing camps - on the one hand, Maccabi's youngsters, Tamir Cohen, Kobbi Moussa, Mohe Mishaelof and Eli Biton, and on the other, Maccabi's foreign players, with the rest of the team caught in the crossfire. A number of players are marked men, but scarred from the Avi Nimni and Reuven Oved affairs, Klinger is hesitant to once again make an extreme move. This time around, he is not expected to throw anyone out, but to quietly search for ways to offload players he doesn't want. Brazilian midfielder Bruno Reiss, Pantsil's Ghana teammate, Ishamel Addo, and Congolese striker Emile Mbamba are all on Klinger's hit list, as is Elad Bonfeld, who wasn't even included in the squad for the game against Bayern. Several names have been mentioned as fresh blood for Maccabi, including Omri Afek, Pini Balili, Elyaniv Barda, Michael Zandberg and Offir Haim, as well as the club's former striker, Andreas Prohanenkovas, who has not settled since a $1 million move to Dynamo Moscow over the summer. No changes will be made until after Maccabi's final Champions League game against Juventus in two weeks time; but sources close to the club say that after that, chairman Loni Herzikovic has given the green light for a radical shakeup. Meanwhile, Herzikovic said yesterday that Klinger would remain with Maccabi for years, describing him as an "outstanding coach."